So I’m sitting here half-watching a 20/20 on OWN and trying to make my blog post. I unsuccessfully searched for a picture of the 20/20 logo, to pep up the post, but no luck. I’m better at finding monster pictures. It’s really interesting episode, to me anyways. It is the case of Stacy Castor, who killed two husbands with antifreeze. We have enjoyed other true crime shows about her. I tried to write my blog post earlier today, while at work. I only got as far as, “It’s my Friday and I’ll cry if I want to.” I have tomorrow off, so it is like Friday. That makes this a Non-Sequitur Thursday right off the bat. Full disclosure: I’m not feeling well tonight. I wanted to bag this blog post till tomorrow, but I have been doing that far too often these days. What’s a silly blogger to do? I guess I’ll find a Throwback Thursday picture to share, so this post doesn’t look completely pathetic. I used this picture two years ago. 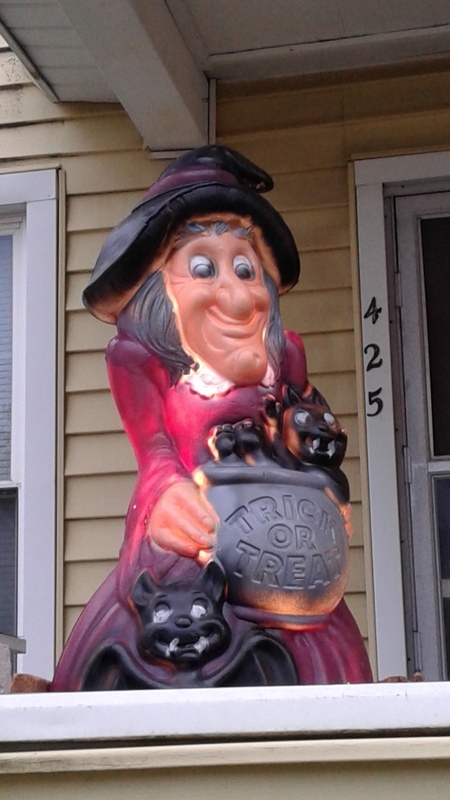 It is a delightful witch we got at Pumpkin Junction in Sauquoit. I must get back there soon. I’m sure I need more Halloween decorations. And maybe a pumpkin or two. Maybe if I’m feeling better tomorrow. And we’ll certainly hope for a better blog post. Posted in humor, personal and tagged 20/20 on OWN, blog post, bloggers sick day, blogging, Halloween, health. Bookmark the permalink.